Whether you prefer subway tile, glass tile or a combination of materials, the backsplash you choose can work well with the laminate countertops you select for your project. Older installations often resulted in a small laminate section that went part way up the wall, but working with an installer on your new counters can let you better plan for a backsplash. You can choose to cover the space from counter to cabinet, or even expand it for range hoods or around windows for a more striking appearance. The dark lines that defined the corners in a lot of laminate installations are long gone from the options today. Now, many new laminate countertops can be installed with a variety of edges to get the look you want. It is important to research installation options for the exact product you are considering, as some versions are more limited in the customization. If you are also considering an undermount sink that should be explored at the same time. To achieve the look of natural stone with a more budget friendly installation, seek out new laminate countertop options that are designed to provide that appearance. Advances in printing have contributed to an impressive variety of options to match nearly any decor preferences. Even with laminate there are many details to consider that can enhance the overall look, so work with a professional to guide you through the process. 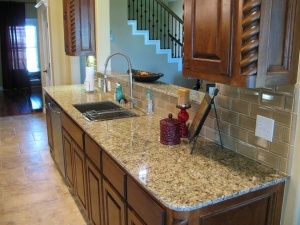 If you are considering new countertops as part of your kitchen updating plans, contact the team at Timco Construction. From simple enhancements to complete kitchen remodels, they can guide you through the process of transforming your Tulsa area home.